If you are visiting Starbucks everyday for more than just their coffee, it is time to learn some copycat recipes for some of their popular food items. Starbucks has mastered the art of healthy and convenient food options and the spinach and feta wrap with cage-free egg white and tomatoes has quickly become a favorite. However, you might want to rethink making this daily trip to the coffee shop a habit. Not only is this "quick bite" pricey but it also contains a fair amount of preservatives and 830 mg of sodium (35 percent of your daily intake). I am a sucker for a good healthy wrap as much as the next person. 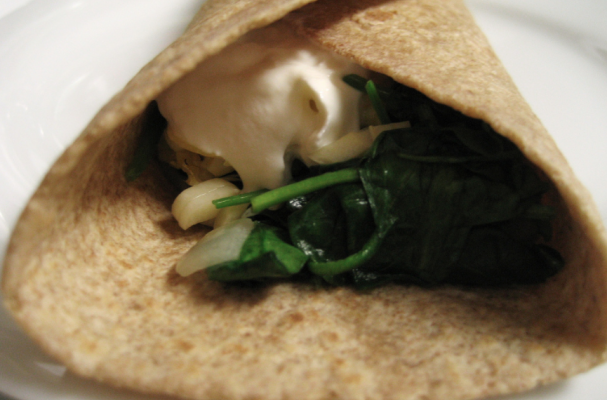 I, like you, appreciate how easy it is to eat a wrap while you are on the go and have written a recipe that satisfies your need for speed and hunger. This copycat cat recipe has all the flavor elements that you love in the classic Starbucks breakfast wrap without all that other stuff. Also, you can afford to feed the whole family this hearty and healthy breakfast without putting a second mortgage on the house (an exaggeration of course). Step 1: Heat a large non-stick skillet over medium high heat and coat with non-stick spray. Add the garlic and cook for 30 seconds before adding the spinach. Saute the spinach for 3 to 5 minutes and season with salt and pepper. Step 2: Add the egg white and cook the spinach scramble until whites have set, about 3 minutes. Step 3: Meanwhile, cover the tortillas with a damp paper towel and heat for 45 seconds. Step 4: Place one tortilla on each plate and divide the egg mixture between the four tortillas. Top with feta cheese and chopped sun dried tomatoes. Step 5: To wrap the tortillas, fold up one end, then both sides. Serve immediately or wrap in foil and take to go.